Group of company UiTM Holdings Sdn. 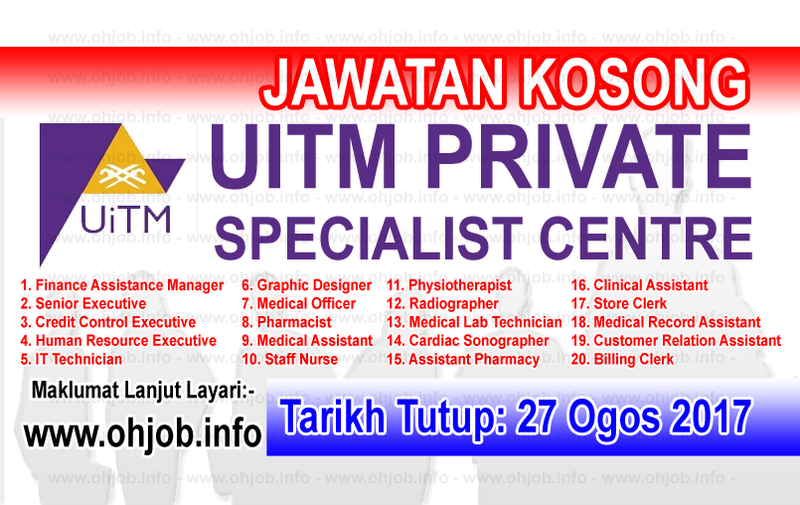 Bhd, UiTM Private Specialist Centre Sdn Bhd (UiTM PSC) is the ‘private wing’ of the Medical Faculty, operating at the Clinical Training Centre (CTC), Sg. Buloh Campus. It has two main components which are private specialist clinic, located at level 2 and private specialist wad, located at level 5. The private wing is capitalize on the available consultant and specialists from the Faculty and some of the support service and facilities available at the CTC. Terima Kasih Kerana Membaca Dan Menyemak Jawatan Kosong UiTM Private Specialist Centre (27 Ogos 2017) Selamat Memohon Dan Semoga Berjaya Kami Ucapkan, Sila LIKE Facebook Page Kami Dan Kongsikan Kepada Semua.